Charley Patton (died 28th April 1934), also known as Charlie Patton, was an American Delta blues musician. He is considered by many to be the "Father of the Delta Blues", and is credited with creating an enduring body of American music and personally inspiring just about every Delta blues man (Palmer, 1995). Musicologist Robert Palmer considers him among the most important musicians that America produced in the twentieth century. Many sources, including musical releases and his gravestone, spell his name "Charley" even though the musician himself spelled his name "Charlie". The Dockery Plantation was home to Charley Patton for many years, and it was here that he learned from bluesman Henry Sloan. Patton's friends Willie Brown, Son House, and Tommy Johnson played parties, picnics, and fish fries in the tenant quarters at Dockery. Howlin' Wolf moved to Dockery Plantation in 1929 to work and soak up Patton's music. The "delta blues" area of Mississippi around Clarksdale is not the geographical delta of the Mississippi River as this lies 300 miles south in Louisiana and to the south of New Orleans. 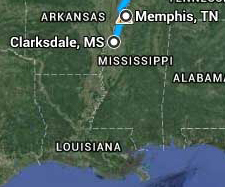 Instead it is a rich agricultual and farming area on the alluvial plain of the lower Mississippi River not the delta.